The future growth of the lithium market will clearly be dominated by e-mobility powered by Li-ion batteries but also increasingly energy storage systems (ESS). With the declining cost of Li-cells, targets for 1 kWh being now very close to 150 USD, they are also becoming attractive for use in private installations combined with increasing use of photovoltaic roof-top electricity generation (PV). In Germany a new regulation demands that for all PV projects exceeding 1MW power generation an energy storage system has to be installed by 2025. This is in order to avoid peak energy stressing the electricity distribution systems, a phenomenon which already pushes European systems to their limits during the summer months and increasingly so with the ongoing addition of new PV systems, be they commercial or private. The German Automobile Manufacturers Association (VDA) considers an electric vehicle penetration rate of 15% to 25% being possible by 2025. The lower range for market penetration of 15% corresponds to some 15 million cars or if we assume a market of 100 million cars by 2025 and an average of 30 kg of LCE needed for the battery 450,000 MT of LCEs required for this segment alone. Canaccord Genuity Research, amongst others, assumes that the overall share of electric vehicles (EV) will climb to over 50% of all Li-ion batteries installed, i.e. being the driver of the expanding lithium market. The absolute growth numbers from Canaccord’s forecast are higher than previous assumptions, however, in line of some forecasts from OEMs. The current growth assumptions will if they materialize, lead to a lithium demand requirement of approximately. 750,000t of LCE. This is an additional 550,000t of LCE required from 2017 till 2025 or the equivalent of almost 70,000t per year of LCE. In Figure 8 the individual sectors growth are described. In 2017, off take agreements for spodumene CG with a Lithium oxide content between 5.0 and 6.0% have been executed, whereby 120,000t of 5.5% spodumene concentrate has been contracted at US$830/t FOB. Every additional 0.1% of Li2O content will garner a premium of US$15/t, enabling prices between 750 US$/mt and 905 US$/mt for spodumene CG 5.0 and 6.0. Also, suppliers who are able to provide a higher quality spodumene CG yielding lower conversion cost will also be able to achieve higher prices. The market for spodumene TG is a specialty chemicals market, which addresses the specific needs for customers in the glass and ceramic industry. Historically, prices have been reflecting the higher value of iron free spodumene like in Lithium carbonate and specific properties of the crystalline material. Therefore, pricing for spodumene TG is directly linked to the Lithium oxide content in Lithium carbonate. Global end-use markets are estimated as follows: ceramics and glass, 35%; batteries, 31%; lubricating greases, 8%; air treatment, 5%; primary aluminum production, 1%; continuous casting, 6%; rubber and thermoplastics, 5%; and other uses, 9%. Lithium use in batteries expanded significantly in recent years because rechargeable lithium batteries were being used increasingly in portable electronic devices and electrical tools. Chile was the leading lithium chemical producer in the world; Argentina, China, and the United States also were major producers. Australia and Zimbabwe were major producers of lithium ore concentrates. The United States remained the leading importer of lithium minerals and compounds and the leading producer of value-added lithium materials. 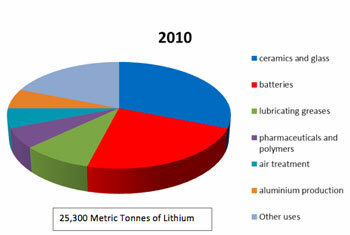 Market conditions improved for lithium-based products in 2010. 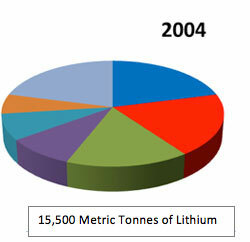 Sales volumes for the major lithium producers were reported to be up more than 30% by mid-2010. Consumption by lithium end-use markets for batteries, ceramics and glass, grease, and other industrial applications all increased. The leading lithium producer in Chile lowered its lithium prices by 20% in 2010. Many new companies continued exploring for lithium on claims worldwide. Numerous claims in Nevada, as well as Argentina, Australia, Bolivia, and Canada, have been leased or staked. The only active lithium carbonate plant in the United States was a brine operation in Nevada. Subsurface brines have become the dominant raw material for lithium carbonate production worldwide because of lower production costs compared with the mining and processing costs for hard-rock ores. Two brine operations in Chile dominate the world market, and a facility at a brine deposit in Argentina produced lithium carbonate and lithium chloride. Two additional brine operations were under development in Argentina. Worldwide, most lithium minerals mined were used directly as ore concentrates in ceramics and glass applications rather than as feedstock for lithium carbonate and other lithium compounds. In an effort to increase the quality of lithium suitable for advanced transportation batteries, the sole active lithium production company in United States began the expansion of its lithium operation in North Carolina to include battery-grade lithium hydroxide. Funding for the project was obtained in part from the U.S. Department of Energy. An emerging Australian lithium ore producer commenced lithium concentrate production in Western Australia. The lithium concentrate was to be converted to battery-grade lithium carbonate in China to supply the Asian market. Australia's leading lithium ore miner merged with an emerging lithium brine mining company to develop a lithium brine operation in Chile. Batteries, especially rechargeable batteries, are the uses for lithium compounds with the largest growth potential. Demand for rechargeable lithium batteries continued to gain market share over rechargeable nonlithium batteries for use in cordless tools, portable computers and cellular telephones, and video cameras. Major automobile companies were pursuing the development of lithium batteries for hybrid electric vehicles - vehicles with an internal combustion engine and a battery-powered electric motor. Most commercially available hybrid vehicles use other types of batteries, although future generations of these vehicles may use lithium. Nonrechargeable lithium batteries were used in calculators, cameras, computers, electronic games, watches, and other devices. Asian technology companies continued to invest in the development of lithium operations in other countries to ensure a stable supply of lithium for their battery industries. With lithium carbonate being one of the lowest cost components of a lithium-ion battery, the issue to be addressed was not cost difference or production efficiency but supply security attained by acquiring lithium from a number of different lithiuU.S. Geological Survey, Mineral Commodity Summaries, January 2011m sources.